Will my Room Divider Fit Through a Standard Doorway? 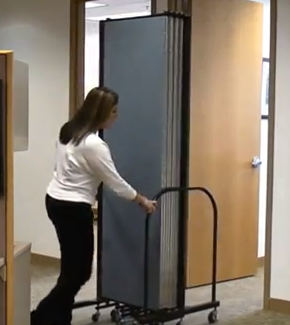 Screenflex Room Dividers – What size room dividers will fit through a standard doorway? The 6’8″ room divider would have to be angled to fit through a standard doorway. Position controllers, that keep the unit open, add 3/4″ to the top of a room divider. This makes the unit 6’8 3/4″ tall. Doors come in a range of standard heights and widths but are commonly 1-3/8-inches thick. In the USA, the standard residential door height is 6′-8″. However, 7′-0″ doors have become common in high-end houses. Commercial doors can be 8′-0″ or more depending on their use and site. The 6′-8″ height is the most common height used. “Standard doorways are 6’8“ tall for interior residential doorways. To make sure your room divider fits through your doorway, we recommend the purchase a 6’0″ room divider or shorter.